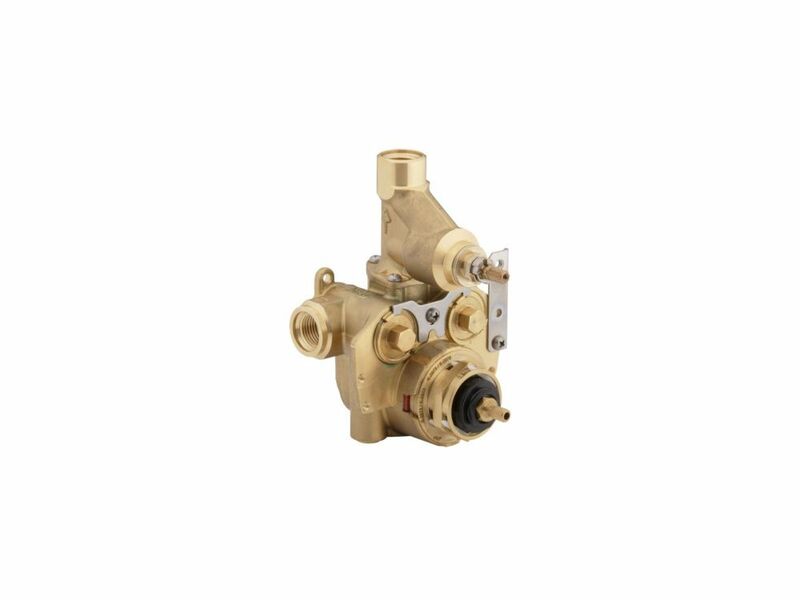 Thermostatic valve allows bather to set and maintain precise temperature. Factory calibrated comfort setting set at 104 degrees Fahrenheit. High-temperature safety stop ensures that water temperature stays below 120 degrees Fahrenheit. 7.2 gpm (gallons per minute) flow rate through top port. KOHLER DTV elevates the experience of showering with approachable, intuitive technology. The one-piece interface design allows the user convenient control of the menu-based navigation system. Also available in store by special order only see store for details. The combination of a HiFlow Rite-Temp<sup></sup> pressure-balancing valve and a 3-way transfer valve allows multiple components to function properly in a custom shower to maximize your experience. This valve package completes the behind-the-wall components needed for the Luxury performance showering packages. Also available in store by special order only see store for details. This Rite-Temp pressure-balancing valve works behind the scenes to prevent scalding and thermal shock for optimal comfort. Additionally, the unit features a diaphragm design that virtually eliminates freeze-ups from contamination and water debris. When paired with compatible trim, this valve delivers a high-temperature limit stop and an optimal comfort zone, so you can set a maximum high and then find and maintain your desired water temperature. Master shower 1/2 inch Thermostatic Valve With Integrated Volume Control And Stops Take showering beyond the ordinary with this 1/2-inch MasterShower thermostatic valve. When paired with a stacked valve trim, this valve delivers a high-temperature limit stop for added safety and a high-flow rate for precise, consistent temperature control. Master shower 1/2 inch Thermostatic Valve With Integrated Volume Control And Stops is rated 4.3 out of 5 by 3. Rated 3 out of 5 by Paul from The valve was heavy and the accompanying. Bancroft trim was... The valve was heavy and the accompanying. Bancroft trim was too upscale for my home. I returned both. Rated 5 out of 5 by ProfC from So far so good... the valve is in place in... So far so good... the valve is in place in the rough-in by the plumber. We’ll know more after the project is completed and we see how well it actually works. Rated 5 out of 5 by JJ22 from Replaced old 14 yr old value. I had it installed with the matching Kohler Mastershower trim kit b... Replaced old 14 yr old value. I had it installed with the matching Kohler Mastershower trim kit by plumber. Home Depot delivered on time and perfect condition.